Whooo knows the time? 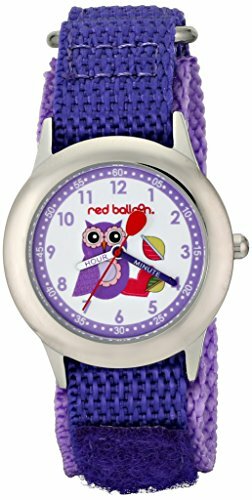 She does when she wears a Red Balloon Love Owl Stainless Steel Purple Time Teacher Watch of her own. With clearly marked hour and minute hands, it's easy to see what time it is at a glance. The sporty wristwatch also has a sturdy nylon strap with a hook-and loop clasp that she can easily adjust to her wrist for comfy custom sizing. Round Time Teacher Stainless Steel Watch with owl character on dial and Red Balloon shaped Seconds Hand. If you have any questions about this product by Red Balloon, contact us by completing and submitting the form below. If you are looking for a specif part number, please include it with your message.